Like Julia Cameron’s The Artist’s Way, Joan Anderson’s bestselling A Year by the Sea revealed a far larger than expected constituency, in the form of thousands of women struggling to realize their full potential. After years of focusing on the needs of others as a wife and mother, Anderson devoted a year to rediscovering herself and reinvigorating her dreams. The questions she asked herself and the insights she gained became the core of the popular weekend workshops Anderson developed to help women figure out how—after being all things to all people—they can finally become what they need to be for themselves. 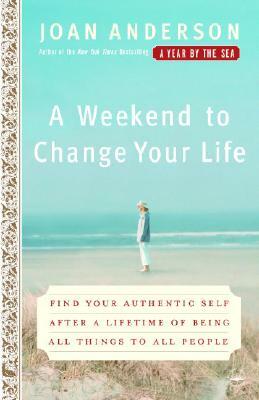 A Weekend to Change Your Life brings Anderson’s techniques to women everywhere, providing a step-by-step path readers can follow at their own pace. Drawing on her own life and on the experiences of the women she meets at her workshops, Anderson shows women how to move beyond the roles they play in relationship to others and reclaim their individuality. Through illustrations and gentle instruction, she illuminates the rewards of nurturing long-neglected talents, revitalizing plans sacrificed to the demands of family life, and redefining oneself by embracing new possibilities. A full life requires cultivation. The minute we take our hands off the plow, fail to reseed, forget to fertilize, we’ve lost our crop. And yet, most women I know, while in the service of some greater good have let their very lives wilt on the vine. Having been taught the fine art of accommodation, most of us have developed a knack for selfless behavior. We’ve dulled our personal lives while propping up everyone else’s, and we’re no longer able even to imagine having any sort of adventure, romance, meaning, or purpose for ourselves. In short, we’ve gotten way off track and taken the wrong road to self-satisfaction, foolishly thinking that after all of the doing, giving, trying, and overworking someone will offer us a reward. But Prince Charming was a bad joke and all the fairy godmothers are dead. Instead of happy ever after, most of us end up with the ache. We wake up each day with an inner gnawing, a hunger for more, a craving for an overhaul, but we are too listless, tired, or depressed to do anything about it. We have spent the greater part of our lives pouring ourselves out like a pitcher. No wonder we feel so empty. But we lack the necessary energy, a helpful roadmap, and any type of guidance and support. Well, it’s time to change all of that. JOAN ANDERSON, is the author of A Year by the Sea, An Unfinished Marriage, and A Walk on the Beach. She lives on Cape Cod, Massachusetts, and conducts weekend workshops for women throughout the country.